When a small business owner sells their business, they must consider the income taxes that they’ll have to pay after the sale. Like any other transaction that makes you money, the sale of a business is considered income and you are required by law to pay taxes on it. This income is often classified as a capital gain and it applies whether you’re selling the assets of a company or shares of a company’s stock. How About a Tax-free Deal? The tax consequences and liabilities that you’ll endure will depend on the type of sale in which you have made with the buyer. Most sellers make the mistake of not consulting with a tax advisor prior to the sale of their business entity, shares, or assets. Because of this, they could end up paying more taxes than they expected to when Tax Day comes around in April. So, it is important to figure out ahead of time how much you’re going to pay in taxes before the sale of the small business even takes place. Are you a Tax Attorney, or Accountant, or just a Pro? 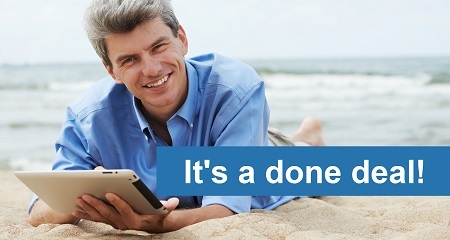 Earn passive income by recommending ExitAdviser . The first tax consideration you need to make is in regards to the type of company that your business is operating under. Do you have a Limited Liability Company, Sole Proprietorship, C Corporation, Partnership, or S Corporation? The answer to this question will determine a lot about how much you will owe in taxes. For example, if you sell the assets of a limited liability company and it makes you a profit, then it will only be taxed one time as a capital gain. The reason for this is because the IRS usually considers sole proprietorships and limited liability companies to be disregarded entities. This means that these companies won’t get taxed separately and you won’t have to file a commercial income tax return. Instead, any profits made from these capital assets will only have to be paid on the owner’s personal income tax form. Of course, you have the option of making your limited liability company a separate entity if you want to, but most people don’t because the tax benefits are so much better when keeping it as a disregarded entity. Now if you were to own a C Corporation and you sell its capital assets for a profit, then you will be taxed two times on the sale. The first tax you’ll have to pay is the corporate tax which coincides with the commercial income tax return. Since corporations are considered separate entities from their owners, the IRS requires each entity to pay their share of taxes from it. The corporation must pay whatever the current corporate tax rate is on capital gains. Then, each shareholder of the company will be subjected to a capital gains tax on their personal income tax return. They won’t have to pay taxes on the full amount of the capital gains, though. The profits of capital assets get distributed equally among the shareholders of the company. Therefore, the amount that was distributed to each shareholder will get multiplied by the capital gains tax rate. The result is the amount that each shareholder must pay in personal taxes. S corporations and partnerships have a similar tax structure in the sense that there is no double taxation like there is with C corporations. When you sell assets through an S corporation or partnership, the individual owners or shareholders are each responsible for paying the taxes on their personal income tax returns. The upside is they don’t have to pay another set of taxes on the commercial income tax return of the company. This makes S corporations perfect for business owners who want to sell shares of their company while still maintaining a single tax rate for the profits. Also, C corporations are not allowed to change their corporate status to an S corporation just to avoid their double taxation. The IRS requires C corporations to change their status a long time before the sale of any assets takes place. This is their way of deterring owners from committing tax evasion. When a small business owner sells stock in their company, they are really selling the entity of the company to the buyer. Remember that selling a stock is like selling a portion of the ownership to your company. The more stock that is purchased, the bigger percentage of the company that your buyer owns. Of course, the buyer will assume a percentage of the debts and liabilities that are attached to their ownership of the company as well. That is why buyers would rather purchase the assets of a company because there are less liability and more value. Sellers, on the other hand, prefer to sell the stock of their company because they will get taxed at a much lower rate than they would if they sold their capital assets. Buyers might not always like this idea, so sellers will typically lower their purchase price in order to make the offer more appealing to the buyer. Anytime the seller makes a profit on the sale of their stock, they have to pay a capital gains tax on that just like the sale of their capital assets. The difference is that stocks are usually held for a lot longer than capital assets, which means the seller will get a more generous tax break for selling stock that they’ve held for longer than one year. Also, the seller must consider which entity is actually selling the stock. If the company is the entity that sells the stock, then double taxation will apply. That is why individual shareholders may decide to sell their own stock to a buyer instead. This will enable the individual seller to only pay capital gains tax on their personal income tax return. Capital assets can be classified in three different ways by the IRS. Businesses typically have assets in the form of real property, depreciable property, and inventory property. Real property is another way of describing the real estate property of the business, such as its land and building structures. For small businesses, they may decide to just sell their real property if they want to relocate or close down altogether. The sale of the real property would get taxed as a separate capital asset unless the buyer was purchasing the entire entity of the company. If the buyer purchases the entity, it would allow the buyer to just take over all the real estate holdings of the company because those properties are under the company’s name. The only time this wouldn’t apply is if the original owner’s name was on the property. Then, the owner would have to actually sell the property through a real estate transaction to the buyer and pay a capital gain tax on the profit. Depreciable property is the type of property which loses value over time. In a business, this could be things like office chairs, computers, furniture and so on. Basically, any items that are actively being used as part of the operation of the business is considered to be depreciable property. Sometimes a business will decide to sell their depreciable property if they are trying to clear out old property in their facility and replace it with the new property. The IRS treats the sale of a depreciable property as a gain or loss, based on the current value of it. This value is almost always lower than what the seller originally purchased it for. If you held the depreciable property for longer than one year before you sold it, then your tax rate will be considerably less than if you held the property for under a year. The current value versus the purchase price will be what decides the tax rate in this situation. Depreciation recapture is the term used to describe the amount of profit you made from selling the depreciable property. Inventory sales pertain to when a business sells a bulk amount of inventory to a buyer. This isn’t the same as selling individual products to customers and getting profits from each of them. The IRS would just consider this part of your normal business income so these transactions don’t get taxed as capital gains. But when you sell big portions of your inventory and it is not the normal type of business transaction that your company conducts, then it is considered to be a capital gain instead. The capital gain tax rate is almost always higher than the corporate or personal tax rates. Companies sometimes want to sell their inventory to buyers if they were not able to sell the products individually at the retail level. This gives them some extra cash back and they don’t have to take too big a loss. And if the money spent on the inventory is more than the cash they get back for it, then they can claim a capital loss on the sale and pay no taxes. Sellers are always looking for a way to pay as little taxes as possible. But, what if you could avoid paying taxes altogether? You won’t necessarily be able to do this with most business selling deals, but there are a few which can be made tax free. One kind of tax-free deal you can make is with stock exchanges. For example, let’s say your buyer has their own corporation and they want to give you stock in their company in exchange for you giving them stock in your company. As long as certain IRS provisions are met which pertain to a reorganization, you can conduct a stock exchange like this and not have to pay any taxes. The IRS states that the seller must receive between 50 to 100% of the buyer’s stock in order for it to be tax-free. As for asset transfers, you can make these tax-free as well if you receive 100% of the buyer’s stock. The only time you will be taxed is if the buyer gave you actual cash for your stock or assets. Otherwise, you can get away with a tax-free transaction by simply keeping it as an exchange of non-cash assets. It is safe to say that sellers wouldn’t mind conducting cash deals with a buyer of their business if the price is right. The problem is that it is harder for sellers to find buyers who are willing to pay 100% cash for all the assets they want. Unless you have truly valuable assets, you’ll struggle to find a buyer who will pay a good price for them. Fortunately, you can offer seller financing to the buyer in which they will make monthly payments on a total fixed amount. This amount is usually a lot higher than the normal cash price would have been, Plus, there will be interest added on to the monthly premiums too. The only downside is that you must let your buyer run the business and hope they don’t make a mess out of it. If they do and then fail to make the remaining payments, you could end up losing your business and the remainder of the money on the deal that you financed for them. On the flip side, you as the seller will be able to get a tax deferral on the monthly payments until you receive the total amount of the agreed price. And if the buyer defaults on the payments, you only have to pay taxes on the money that the buyer has already paid you. Not only that, you get to retain ownership of your company while keeping the money the buyer already paid you. This outcome can be great as long as the company has not lost any of its income potentials as a result of the buyer running it. These are serious considerations you need to make before you offer seller financing to a buyer. But if you are just selling some of your assets through seller financing while retaining stock ownership of the company, then it may be a less risky transaction for you. Finally, don’t forget that state and local governments can also charge you taxes. Even if you live in a state like Florida which has no personal state income tax, they do have a corporate income tax. This might be something that influences you to form an LLC rather than a C corporation so you can avoid paying corporate state income tax. If you live in a city like New York, then you’ll have to deal with city income taxes too. So, definitely take into consideration the location that your business is in and all the other tax rates that you’ll have to pay to the state and local governments. This is not a tax advice. All decisions regarding the tax implications of a business sale should be made in consultation with a qualified Tax Attorney.